I wrote a post a few months ago that listed a few criticisms of the Boots website, which contained a number of usability and design flaws. I suggested ten things Boots could improve online in the last article, and the retailer seems to have dealt witth at least six of them… I’d love to hear more from Boots about the effects of these changes. Having navigation and other important links above the fold can make a big difference when it comes to getting visitors to click on them. Boots now has its navigation links visible, though some special offers are still placed where they could be missed. The basket is now more easily spotted, in bold text at the top centre of each page, while the checkout link is one of the clearest on the basket summary. The idea here is to make links like this, which push customers closer to a purchase as clear as possible. Last time, having already entered my address when registering before the checkout process, I had to re-enter it for my delivery details. This unnecessary step has now been removed, making the process a little bit easier. If items aren’t in stock and retailers choose to still display them, then offering to contact customers is a good idea. I haven’t managed to find any out of stock items today, so perhaps Boots has decided to simply not list unavailable products, which is another good way of dealing with the issue. These details, potentially vital to a customer’s purchase decision, are still not listed on product pages, which would be a good place to make this information clear. Boots should be applauded for making its free delivery for orders over £45 nice and clear on the homepage, though it could do better by advising customers with orders under this threshold that they can spend a bit more to get this offer. It is a problem that customers have to click on the shopping basket, then the checkout link, before they can get information about delivery charges and times. This has not changed, with more detail and better product photos required, especially for more complex and expensive medical products like this. Navigation options are still displayed throughout the checkout, so customers can easily click away, exit the process and lose the details they have entered. Boots is missing out on the opportunity to get customers on their email list by not displaying email signup forms around the site. 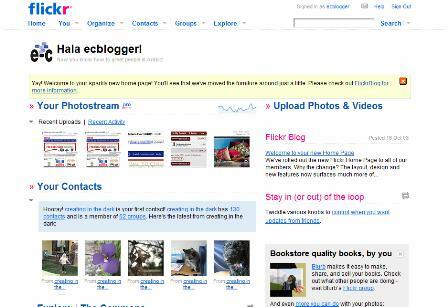 Photo sharing site Flickr today launched a new version of its homepage, altering the look and adding a few new features.